The blood of ancient Finnish shamen, it appears, still flows through the veins of latter-day Finns, particularly those of a musical persuasion. 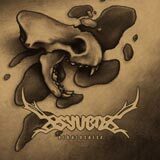 Specifically the ever-prolific, yet mysteriously reclusive, Circle Of Ourobous, the deeply magickal, thoroughly shamanic Aural Hypnox circle – Aeoga, Arktau Eos, Zoat-Aeon et al – and now Syven, a duo consisting of vocalist Andy Koski-Semmens and instrumentalist Aslak Tolonen. Koski-Semmens’ rich stentorian baritone takes centre-stage, flanked by minimal tribal pounding and various atmospheric devices. The lead instrument across Aikaintaite, other than Koski-Semmens’ powerful throat, is the Kantele – a traditional type of Finnish Zither – expertly wielded by Tolonen. Its silvery, bell-like tones can be heard throughout the entire recording, alongside huge funeral-doom-esque guitars and haunting delayed lead lines ala early Paradise Lost. Aikaintaite is a strange beast, tonally speaking. Syven’s approach is clearly an organic, naturalistic one, yet the sound palette here often comes across as a little too clean and processed. It’s hard to tell exactly what is played ‘live’ and what is programmed, something that I find, personally, takes some of the edge off of proceedings, unfortunately. The literally naturalistic approach of, say, Arktau Eos would help restore some of the tonal grit that a project like this needs before it starts to edge toward the dreaded ‘New Age Music’ side of things. But, personal quibbles aside, Syven are in possession of much power – Koski-Semmens’ commanding bellows, exhalations and soaring tones are very much in the same vein as Kris Rygg’s performance on Ulver’s A Quick Fix Of Melancholy EP – semi-operatic but lacking in the self-indulgence that can be found in such styles. Syven is Finnish for Depth and much depth indeed can be heard in Koski-Semmens’ powerful throat. Of course, musically-speaking Tolonen more than holds up his end of the depth. His harmonically-rich, silver-toned Kantele rings out strong and sharp throughout. The mood is subdued and full of melancholy, conjured equally by that voice, the funereal guitars and the gorgeous sound of the Kantele. In many ways the five tracks here are best taken as five movements of one overarching piece, due to the sustained sound palette. This is not a criticism, far from it, but to single out any one of the tracks would be to detract from the cumulative effect of the album. Whilst the shamanic influence is clear and deeply felt on Aikaintaite, it doesn’t resonate as strongly as with some of the afore-mentioned Finnish acts, mostly due to the highly polished sound. The Kantele may be effectively the backbone of Syven’s sound, but they don’t fall into the folk trap of some other users of traditional instrumentation – something that I am personally thankful for. On the whole, this is certainly a worthy endeavour and admirers of all the previously-mentioned musicians should find much to admire within, along with lovers of the classier end of the Martial and Neofol movement. I guess it just doesn’t hit me as deeply as it seems to have affected some, judging by other reviews online. I suspect that may be my fault more than Syven’s.